This fast multimedia NAS box can tell you a thing or two. When it comes to fast, superbly competent NAS boxes, no company does it better than QNAP. Some of the company’s boxes, including the TS-253B reviewed here, even feature HDMI output for direct management and displaying multimedia via an attached display. That's cool, but we forgot about all it when the box spoke to us. “System boot completed.” Those were the words that distracted us. Conversations with a NAS box are usually one-sided, as in invectives from the operator when things go wrong. Most boxes simply emit R2D2-style beeps and possibly a whistle (if you have sufficient imagination). Not being C3P0, you have to take them in context to have a prayer for comprehension. QNAP has hired its TS-253 a companion female protocol droid. "System boot completed" is the most commonly spoken phrase, but she also speaks when you update the firmware, telling you not to power off, and when it's completed. Otherwise, loud beeps predominate, so consider this a work in progress. But it’s still cool and we hope QNAP continues it. The small OLED display that’s on the front panel is actually more useful than the speech function. Using the two touch buttons next to it, you can call up the network name and OS version, IP address of the first and second network adapters, and the model name. That's handy if you’re trying to figure out which box is which in a row of them, but it's lacking in administrative functions, such as formatting, rebooting, and so on. Both the OLED and aural feedback are nice usability enhancements, though we found no way to tailor the voice feedback in the control panel. The first thing you’ll notice about the QNAP TS-253B is its good looks. The company has moved beyond the standard all-black or all-white boxes it has traditionally marketed, and decided a bit more color is in order. In this case, there's a cobalt blue front quarter-panel. Though hard to see in this image, the TS-253B sports an OLED status display. The rest of the front panel is traditional NAS. The box also features a multimedia remote for playback via the HDMI port. The TS-253B sports two full-sized 3.5-inch bays, hidden behind a front cover that simply slides off to the side—once you unlock it, that is. The symbol on the side of the unit that indicates that the restraining latch is locked is both difficult to see and confusing in appearance. We didn’t actually spot it until we’d forced the cover off. That latch was undamaged, but perhaps standard lock/unlock icons on the front rather than the side of the unit might save others from the same fate—minor as it may be. On the other hand, we really liked the pop-off plastic rails that secure hard drives in place without resorting to screws. They won’t work with 2.5-inch drives, but they make quick work of adding and/or swapping mechanical hard drives. The TS-235B-4G we tested was built around an Intel Celeron J3455 (Apollo Lake) quad-core CPU with Intel HD 500 graphics, and 4GB of RAM. It’s both available with and expandable to 8GB of memory. Along with the previously mentioned OLED status display and the touch buttons, the front panel is home to a USB Type-C port, an old-school Type-A USB 3.0 port, a memory card reader, and a quick-copy button (it copies the contents of whatever media is inserted). There are also traditional status lights, so you don’t have to fire up the OLED just to see if the LAN and USB ports are operating correctly. There’s no shortage of ports on the back of the TS-253B. Dual LAN ports can increase throughput if your router supports link aggregation. There are a whopping four USB 3.0 ports in back, along with dual gigabit ethernet ports, two HDMI 1.4b ports, two 3.5mm microphone jacks, and 3.5mm auxiliary audio jacks. There’s also a Kensington lock port as well as access to the unit’s mini-PCIe slot that will accept 10GbE, M.2 SSD, wireless internet, or USB 3.1 Gen 2 10Gbit/sec USB cards. Local management and display via the HDMI ports requires installing HybridDesk Station and a host of apps that can be used locally rather than via a browser on a remote PC. A remote control is included to facilitate multimedia playback from the comfortable confines of your couch. We’ll get to the multimedia in a bit. 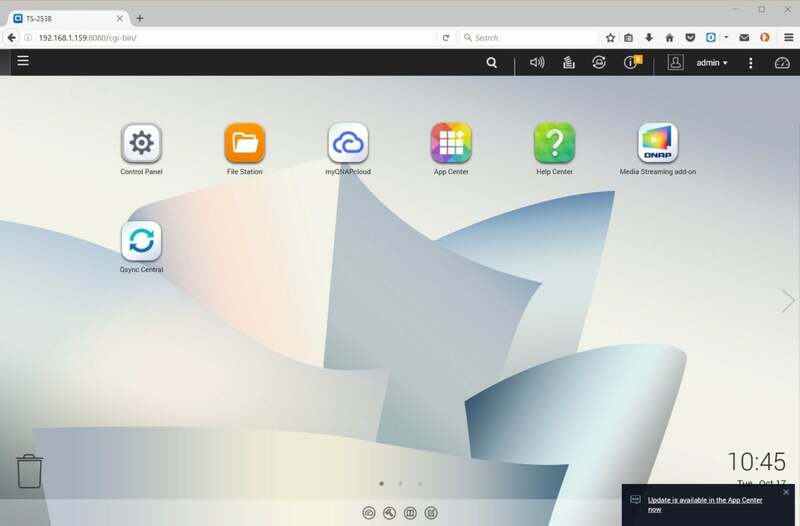 If you haven’t seen the QNAP windows-inside-a-browser operating system, take it for a spin by clicking here. It’s based on Linux, and QNAP has baked in just about all the capabilities you can think of: Backup, multimedia serving, virtual machine hosting, surveillance, web and email hosting, and more. There’s literally too much to cover here, so check out the demo and be sure to browse the app center. I’m pretty sure you’ll be impressed. 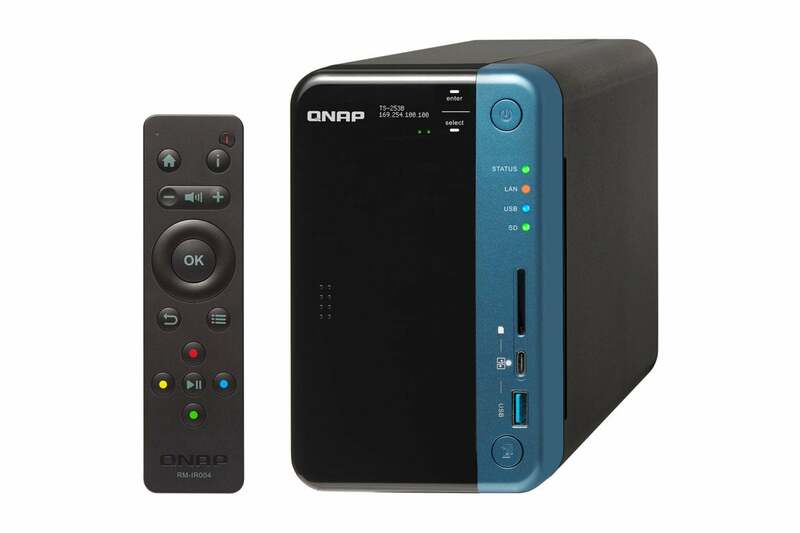 I use a QNAP HS-251 for storing music compositions for use on several PCs, as well as backing up all my stuff via FTP. In other words, I use it a lot and have been nonplussed over issues with its Hybrid Sync backup application. One of its jobs left tens of thousands of tiny files on one of the PCs I was backing up, while jobs randomly failed. Deleting said files cost me almost an hour of my life. I’ve gone back to the more stable Backup Manager, which isn’t a dead simple process as it’s no longer in the App store, and I won’t be using Hybrid Sync until I see no complaints for at least six months. QNAP’s backup capabilities are second to none, but backup needs to be reliable—no ifs, ands, or buts. Clever, attractive, and capable; QTS might eventually fully mimic a PC. It’s darn close now and can be used with a keyboard, mouse, and display. A more recent issue was failure after a couple of months of OS version 4.3.3.0188 to reach the internet, and the internet was most decidedly available on my local network. This in effect disabled automatic updates, and I was forced to update manually (download and install using the control panel) to OS version 4.3.3.0262 to cure the problem. This is relatively minor stuff, at least the internet issue was, but the point is, if you don’t have significant computer experience, a QNAP box might not be for you. QTS is stable for the most part, but QNAP definitely needs to focus more on reliability rather than simply piling on new features. 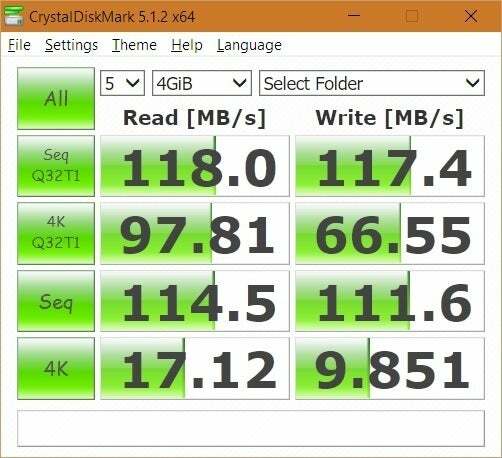 We tested the TS-253B over gigabit ethernet with a single 1GB Sandisk Ultra 3D SSD on board. The box has dual ethernet ports, but our current test router doesn’t support aggregated ports. 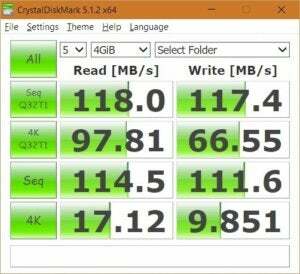 CrystalDiskMark rated the box at 109MBps reading and 110MBps writing large sequential files. That’s very good, and very consistent. 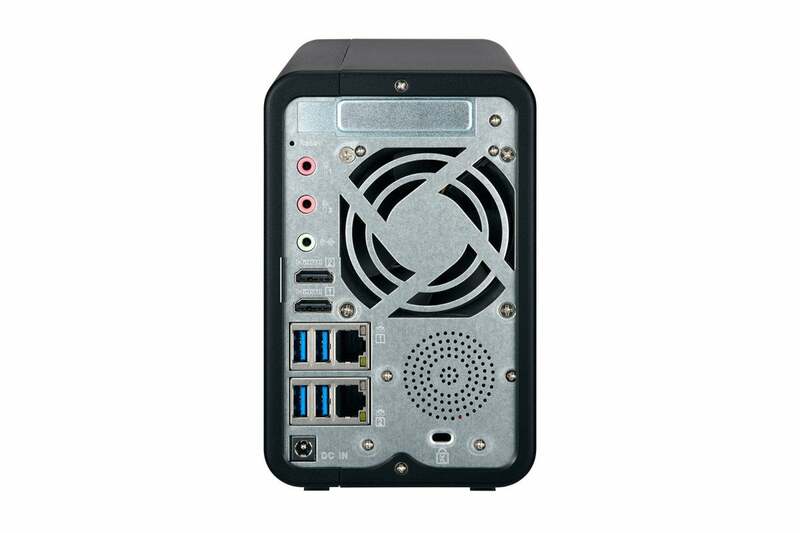 This is a great box for backup and basic file operations. You can see the rest of the TS-253B’s numbers below, all of which are near or at the top of our chart. The TS-253B turned in superior numbers in CrystalDiskMark. 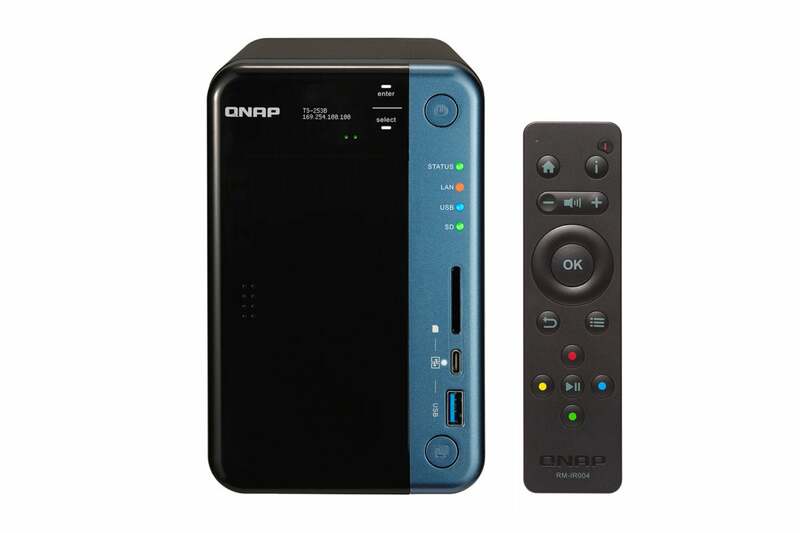 Subjectively, the QNAP browser interface reacted very snappily. Multimedia delivery was quite good all the way through 1080p, both over the network and to the local display. Streaming 720p or 1080p simultaneously was fine up to the five devices at a time we threw at it. QNAP’s claims of dexterity with 2160p (4K UHD) video, however, is a bit disingenuous. Some low-bit-rate, 30-frames-per-second titles played, but most of our 60fps and HDR files would not. Transcoding works fine, but is much slower with 4K. The CPU and chipset simply don’t have the chops to handle it, as do some of the boxes powered by ARM-based CPUs (Synology’s much-cheaper DS216Play, for instance). We tested DLNA through Windows Media Player with the LAV filters; the Plex Player streaming from the Plex server installed on the TS-253B, and PowerDVD 17 using both DLNA and direct playback. Note: In our earlier roundup, the Plex multimedia streaming platform did not function properly, or at all, on many of the boxes we tested. It’s now working flawlessly, both through a browser and various client software. As a matter of fact, it did by far the best job playing 2160p video on our Core i7-3770 PC, even attempting to render some of the color/contrast in our HDR files. Judged simply as a NAS box, the TS-253B is excellent: fast, upgradeable, and with a superb operating system that tops the industry in capabilities. Local management via an attached display is also a major perquisite, and we love the advent of aural feedback. The box’s HDMI output also lets it fit perfectly into a 1080p multimedia environment, which covers 95 percent of what’s out there today. If there’s no 4K in your future, go for it—assuming the $525 price tag doesn’t faze you and you have decent tech chops to handle the occasional software glitch. 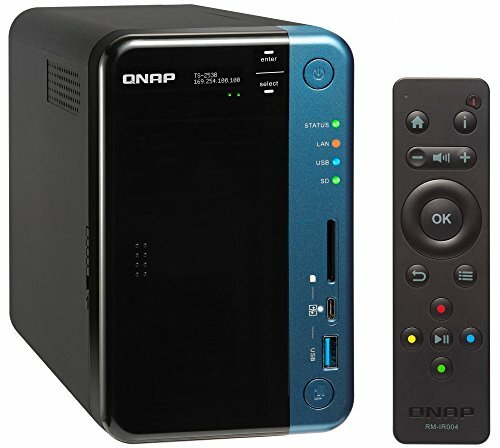 All that said, if 4K is in your future, wait until QNAP puts out a box that does it well. If it isn’t, most users will be better off with a cheaper QNAP such as the TS-251, WD’s My Cloud series (not the My Cloud Home), or Seagate’s Personal Cloud, each of which offer all the essentials, including the same or better multimedia streaming, for a whole lot less. Note: This article was 11/16/2017 updated to talk about additional voice feedback provided by the TS-253B.